Spray 8-quart nonstick Dutch oven with cooking spray; heat over medium heat. Add garlic and onion; cook about 2 minutes, stirring occasionally, until onion is tender. Stir in remaining ingredients except pasta. Heat to boiling. Reduce heat; cover and simmer 45 minutes. Heat to boiling. Stir in pasta. Return to boiling. Reduce heat; simmer uncovered 10 to 15 minutes or until pasta is tender. 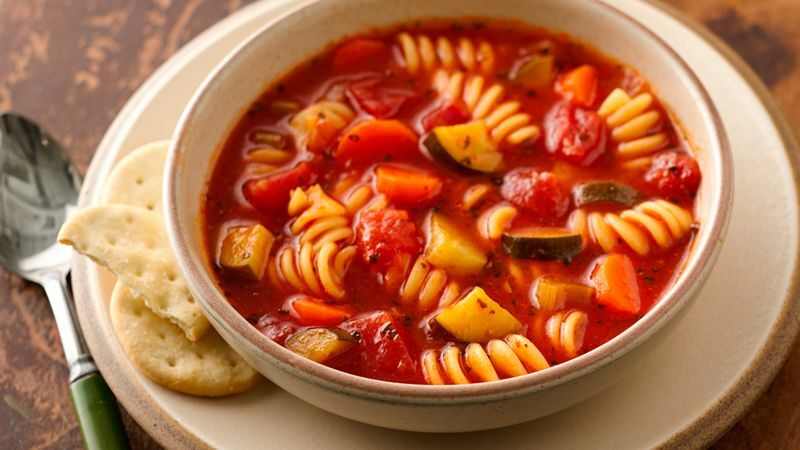 This soup goes great with focaccia and sliced cheese. Then for dessert, spumoni ice cream and Betty Crocker® brownies. Enjoy with ready-made pesto and grated Parmesan cheese from the dairy or deli section of your grocery store.